NRG Stadium - Houston, Texas"
This is the second tax payer financed sports venue in Houston built under the direction of the Houston sports authority in the past three years. 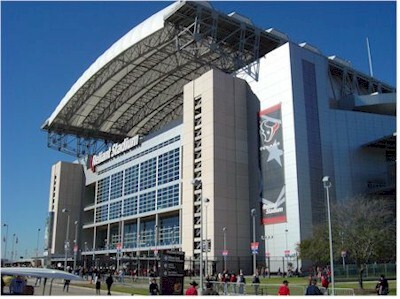 The first being the Astros Minute Maid Park (2000 - $250,000,000), followed by this, the Texans NRG Stadium (2002 - $352,000,000) and lastly the Rockets Toyota Center (2003 - $235,000,000). NRG Stadium is a great venue for football if you can afford a ticket and don't sit where the sun will bake you as it moves across the seats with the roof open. The playing surface is palletized natural grass. This sounds good but the grass appears not be very durable. During commercial breaks ground crews were out fixing bad spots in the grass. NRG dwarfs the old Astro Dome next door only because the dome was constructed well below ground level and the NRG Stadium starts at ground level. This makes for long walks up the ramp to level 5. There are escalators and elevators but the capacity is limited in a crowd. I don't think there is a bad seat in the whole place. The sound system had a lot of feedback squealing back at us when the stadium announcers volume was increased during one of the many commercials sports fans are subjected to in stadiums these days. NRG is also the home of the Houston Rodeo. 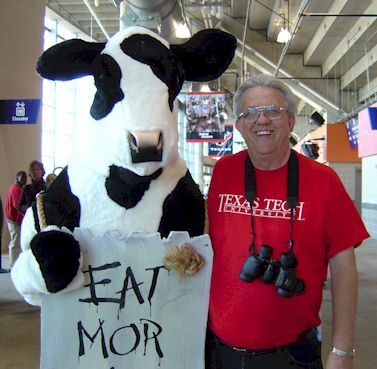 My first opportunity to visit NRG Stadium was the 2003 EV-1 Houston Bowl. The Stadium was about 80% full with approximately 50,000 fans in attendance. Parking $10, tickets on level five $50, cokes $3.50. What deal, now I know why I primarily follow High School Football. 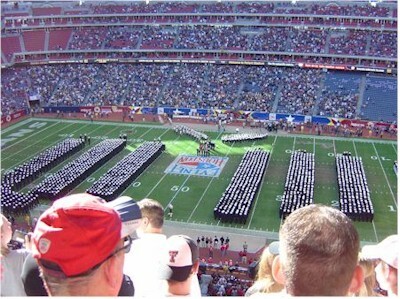 One of the neat things about playing Navy is you get to watch as the Midshipman march out onto the field in formation. The game was dedicated to Bill McCool - U.S. Naval Academy and Rick Husbands - Texas Tech University, both lost their lives in the shuttle Columbia disaster. The game was touted as the run (Navy) against the pass (Tech). It was a fun game to watch but the most exciting part was when they closed lid on the stadium in the 3rd quarter. They can close the roof in less than 10 minutes. I sure wish they would have closed that when the sun was beating down on my head.